Developments in vehicle electronics over the past few years have drastically changed all repairs in the auto body world. The need to understand how all these new electronics operate as well as how to diagnose and repair problems related to the electronics has forever changed all of our careers. These new electronics have also had an impact on the customer. Simple procedures have new complexities that many do not understand. “Why can’t you just do this?” is a common phrase heard from customers today. Looking at how everything we know has changed and how much more it’s going to change is going to take up a lot of body shop owners and managers’ energy. How to keep up with all this change will be a daunting task. Partnerships with vendors and new service providers will be more critical than ever. We’ve had a shortage of technicians in the collision repair industry for years. The perception of what a body technician is and the pay scale has kept many from entering the field. I know there’s more to it than that, but in the interest of brevity, I’ll leave it at that. The evolution of electronics has created both a dilemma and an opportunity. We now recognize that we need a new breed of technician with a new skill set. The need for an electronics technician is now being recognized by the industry. Where do we find a technician with computer and electronics skills? I-CAR’s new focus on electronics may just bring new life back into the repair industry. Before, the only thing we had to offer prospects was a job perceived as dusty and dirty. Now, we can offer a job centered around computers and electronics to a new computer-savvy generation – something that would appeal equally to males and females. What an opportunity to take to vo-tech schools to bring back interest in the automotive trades! When you talk to young people about collision and mention the future of repairing self-driving or self-aware vehicles and that so much of the repair will involve electronics, it can help wipe away their preconceived notions about automotive repair. Add into the equation steady jobs, low number of layoffs (if any) and tremendous room for advancement and all of a sudden it sounds like a great career. Heck, I might even decide to take one of those jobs if I could just figure out my phone. You need computer-savvy technicians. We all do. Changing the approach now is an absolute must for all of us. The possibility of growing your business has never been more in your face than any other time in our history. The electronics evolution has added new services to vehicle repair. Revenue in shops is increasing without adding more cars – a bonus to our industry. I realize that it does increase severity in some cases, but these electronics have proven to reduce bodily injury costs in crashes – a major benefit to these electronics. Add the lifesaving benefits and you see the value. Rising severity will be the part we may have to learn to live with. More shops or companies offering diagnostic services or doing these services “in house” will help control the severity issue. This entails partnering with a company or shop that can do your pre- and post-repair scans and recalibrations or see if it would be more beneficial to buy the equipment. The more these services are provided on-site versus towing or shipping vehicles to a dealer, the more time and cost will be saved. Keep in mind these new services will not just focus on sensors in bumpers and radars or cameras. Many new components inside the vehicle will also require reprogramming. Heated seats, heated steering wheels, AC in the seats, even entertainment systems will require a technician with some electronics background for repairs or even installation. The opportunity that’s right in front of you shouldn’t scare you but thrill you about the possibilities. The evolution has even brought new electronics companies to the forefront, including Autel, Launch Tech, Drew Technologies, AirPro Diagnostics, CAS of New England, asTech, Smart Express, Elite Electronics, Bosch and many more companies offering tools or services to diagnose and repair the electronics. Some can do the pre- and post-repair scans, and others can do recalibrations and programming too. Having these services at the shop saves on repair times and the need for personnel to transport vehicles. This also alleviates the headache technicians might experience getting into repairs they do not know. Using the services of the aforementioned companies or buying your own equipment can reduce stress on not only technicians but the entire shop. 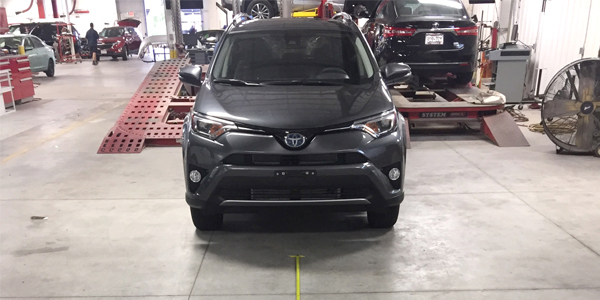 If a shop takes the route of buying the equipment necessary for scanning a vehicle, they might also consider buying the targets required to recalibrate cameras and sensors. That way, you have more control of costs and your income. These systems and needs will only increase in vehicles. Also, please remember it is not just top-end vehicles that will need these services. Some form of advanced driver-assistance systems (ADAS) will be found in all vehicles sold by 2020. Change is hard for most people. Most everyone wants some familiarity to make them feel at ease with a task. When we’re unfamiliar with a task, it adds time and stress. The same goes for the collision repair industry. The repairs technicians perform haven’t changed for many years. Now, change is slamming the industry. Many wanted to ignore it and hope somebody figures it out or it goes away. Now we must figure it out for ourselves based on our abilities. We need to read instructions and follow them diligently. It is no longer optional to learn or train. With the advancements we’ve seen, the dreams of the future are colliding. Once a dream is envisioned, engineers are making it a reality faster than ever. The speed of computers and abilities of computer software are improving at incredible levels. The blur between imagination and reality is closing much quicker than we ever could have thought. The advancements of AI or artificial intelligence and what effect it will have on the future of automobiles is exciting and frightening. So, you must decide. The days of our industry just fixing damaged vehicle bodies are rapidly coming to an end. Diversifying your services or planning for the needed electronic procedures will be a major change for us all. More airbags in vehicles was a major change for us too. This is a much bigger change as it will affect all systems, not just one. I still have people complaining about tire pressure monitoring systems or TPMS. Sensors and cameras will not just be outside the vehicle. New designs to detect driver conditions will be in place to assist or take over in different situations. Drowsy driving is a major problem on today’s roadways. According to the Centers for Disease Control and Prevention (CDC), an estimated one in 25 adult drivers admit to having having fallen asleep while driving in the past 30 days. The National Highway Traffic Safety Administration (NHTSA) has estimated that up to 6,000 fatal crashes per year are related to drowsy driving. Over 70 million people in the U.S. have sleep disorders preventing them from getting a proper amount of sleep. This has led vehicle manufacturers to research cameras and sensors to detect when a driver is drowsy. Current lane departure and lane keep assist systems warn drivers when they start swerving too much between lanes. New cameras and sensors located inside the vehicle will detect eye and head position of drivers as well as heartbeat while driving. If your treadmill can detect your heart rate, so can your steering wheel. The biggest difference is the vehicle will either warn you or take over and pull over safely. Family connectivity will become more advanced. Distracted driving is still the no. 1 cause of collisions in the U.S. Reducing the distraction and keeping the driver from taking their eyes off the road is key. Kids have always been a distraction to drivers. The constant moving of your eyes from the road to the backseat is a concern to all on the road. Having screens or devices to help to assist in communicating with individuals in the backseat are being introduced. Screens similar to airplane screens will allow passengers to see where they’re going and how long before they’re there. Parents can also set up movies or educational programs to entertain and inform passengers during trips. Connected vehicles are rapidly becoming reality. The ability of vehicles to communicate with each other and give the driver a much more detailed view of their surroundings and danger is a hot topic. Vehicles being able to communicate dangerous braking situations or distracted drivers or even road congestion have long been sought by vehicle manufacturers. No longer will drivers have to rely on their own awareness but have multiple points of awareness built into the vehicle. Reducing reaction times in events and reducing stress while driving will be a major sell to these features. Sensors that detect extreme light conditions and can automatically darken windows like rearview mirrors are already developed and being use in some vehicles. The more cameras, sensors and computers being used and developed, the more vehicle repair will change. Changes in metals, plastics and composites are not the only changes we have to keep up with. A shop being able to do all repairs in-house may not be reality. But it will be necessary for a shop to have the ability and knowledge to diagnose and repair all aspects of the vehicle. Partnerships with vendors will become more important than ever. Training and knowledge is also a key to knowing how to do our jobs. I could go on for pages about the new developments and electronics and construction of vehicles. The point is that change is happening. You will need to decide: Are you in or are you out?